International Bird Rescue – Every Bird Matters» Blog Archive » Our 45th Anniversary Ambassador Bird…the Surf Scoter! Our 45th Anniversary Ambassador Bird…the Surf Scoter! 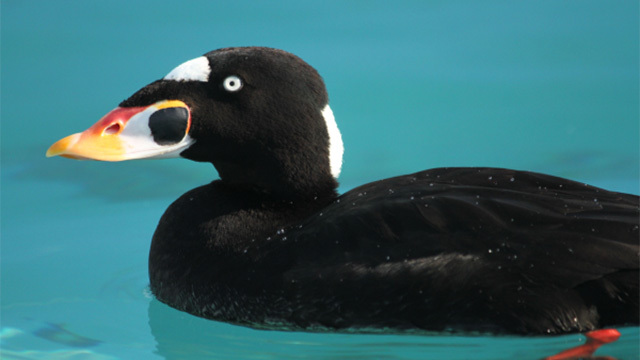 In honor of our 45th anniversary, we have chosen the Surf Scoter as our ambassador bird. International Bird Rescue has a long history working with these iconic ducks. Surf Scoters were a seabird species deeply affected by the 1971 oil spill at the Golden Gate Bridge which led directly to the formation of Bird Rescue in April of that same year. In 2007, Surf Scoters were also a key species during the Cosco Busan spill. We saw them again in great numbers during the 2015 Mystery Goo event in San Francisco Bay. These striking birds are easily seen from shores and boats even without binoculars, making them a great learning target for new birders and children. In addition, they are very good patients during rehabilitation and heal relatively quickly. Learn more about Surf Scoters at AllAboutBirds.org. This entry was posted on Tuesday, April 5th, 2016 at 10:44 am and is filed under Events, Features, News. You can follow any responses to this entry through the RSS 2.0 feed. You can skip to the end and leave a response. Pinging is currently not allowed.